The Uldale Fells (known by most as the Back O'Skidda) in the Northern Lake District are considered very much unfrequented and therefore missed by many visitors to the area. People consider them dull but this is a tad harsh. We were surprised by how few people we saw today particularly as the visibility, weather and conditions underfoot were quite good. There are wide ranging views to be had covering the entire route and the Skiddaw range. The walk starts in the tiny hamlet of Longlands where there is parking for about 6 cars just near the Bridge. - the path starts and finishes from this point. The path is clear at the start but soon tapers off therefore good compass work or a GPS would be handy in poor visibility but in clear weather the summit of Longlands Fell is not in doubt. From here it is best to transit over Lowthwaite Fell and make your way down the grassy slope back to the path coming in from the left over Broad Moss. From here there is a good path to Little Sca Fell with the summit of Great Sca Fell a short way ahead. We decided at the start of the walk that if we felt good and the visibility was ok that we would bag Knott and in the end this was a nice gentle walk to the vast summit. Retracing our steps back to Great Sca Fell we then made our way down to Meal Fell which has both a summit Cairn and a generous wind shelter - it was here that the wind got up and therefore we utilised the shelter for lunch. Whilst lunching, we met the only other walker we saw all day who was on his way over to Knott. From Meal Fell it is quite a steep descent to the idyllic pass at Trusmadoor before making height again up to the curiously named fell of Great Cockup. It is thought the fells name originates from the Old English language translation of "secluded valley for Woodcock or Black Grouse". From the summit we made our way back to Trusmadoor and then a long transit back to Longlands. The Lake District can get quite busy in September - not here! A walk definitely to be repeated. The summit of Knott from Great Sca Fell - can you spot the solitary walker on the top? Path to Meal Fell with Great Cockup in the background. 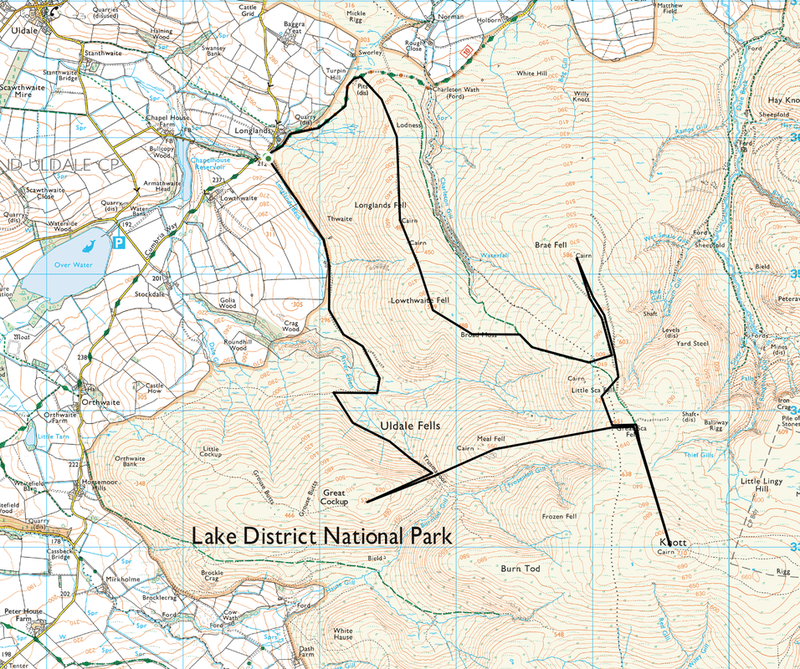 ​Bassenthwaite Lake is the large expanse of water to the left with Over Water to the right.